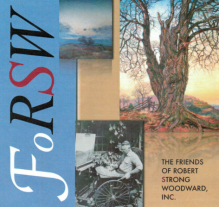 RSW- Artwork page, "April Sugaring"
White & Wyckoff Mfg. Co. of Holyoke reproduced this as a Christmas card for 1946 in color. See also the Sugaring Gallery for related pieces. See also the Buildings Gallery for related pieces. "Repainted in 1941. 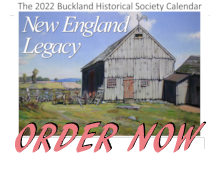 Made from a very early canvas of Maynard's sugar house, Buckland, in the first years of my career. 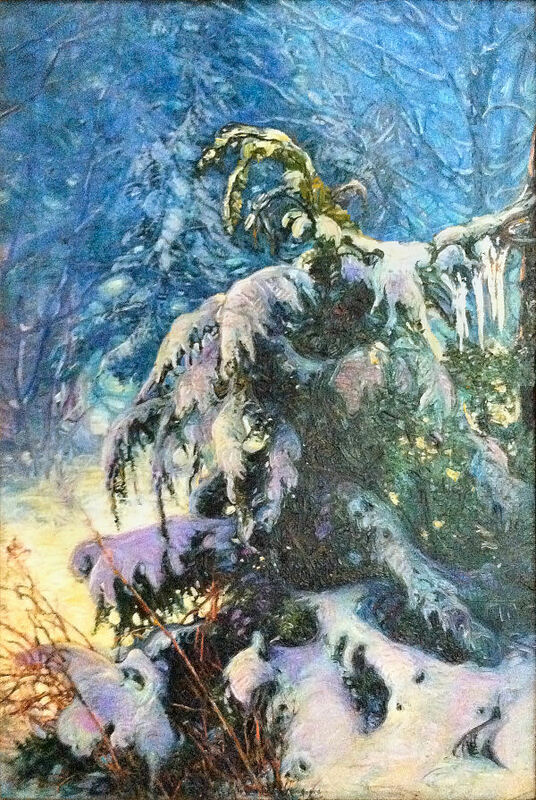 It darkened with varnish some, but I always liked the subject matter so much I made this new canvas from it in the studio in 1941 and destroyed the old canvas. White & Wyckoff Mfg. Co. of Holyoke reproduced this as a Christmas card for 1946 in color. Also, they made plates for larger colored reproductions of it for the1946 Annual Exhibition of the Grand Central Art Galleries." "This reproduction is somewhat disappointing,---because the color of this painting is one of its chief charms. Sugar-house in deep violet, blue shadow, against pale April-blue sky and rose-colored woodland. Old red sap buckets hang on sunlit maples. 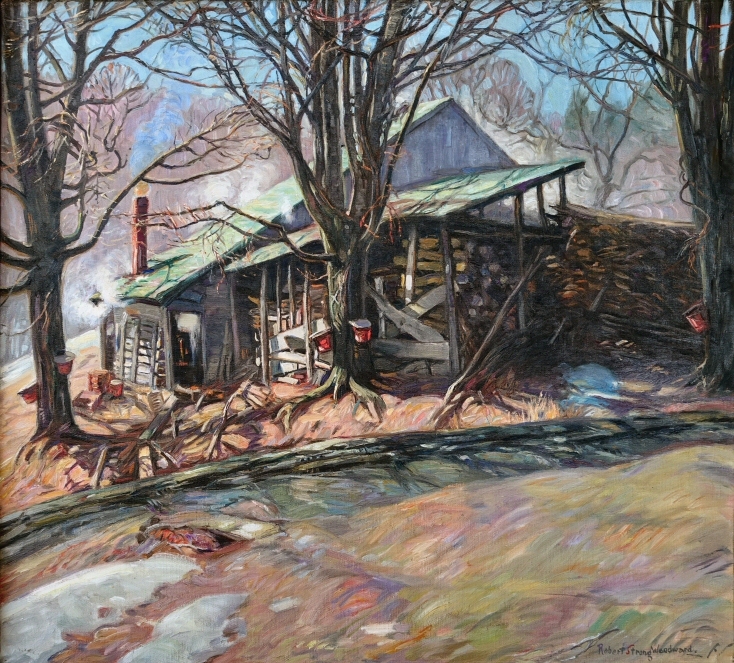 Wood-pile, road and foreground are opalescent, with flesh-color, violet and yellow predominant. White snow-drifts here and there. Possibly suggestive to you of sugar-time in Ohio! The steam from the boiling sap permeates the entire atmosphere!" 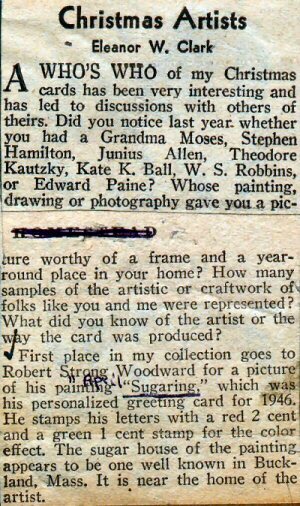 We find it interesting that in his sepia print comments, RSW remarks, "Possibly suggestive to you of sugar-time in Ohio!" Though he has always been catagorically seen as strictly a regional "New England" landscapist, we do not believe he was always satisfied with such restriction. 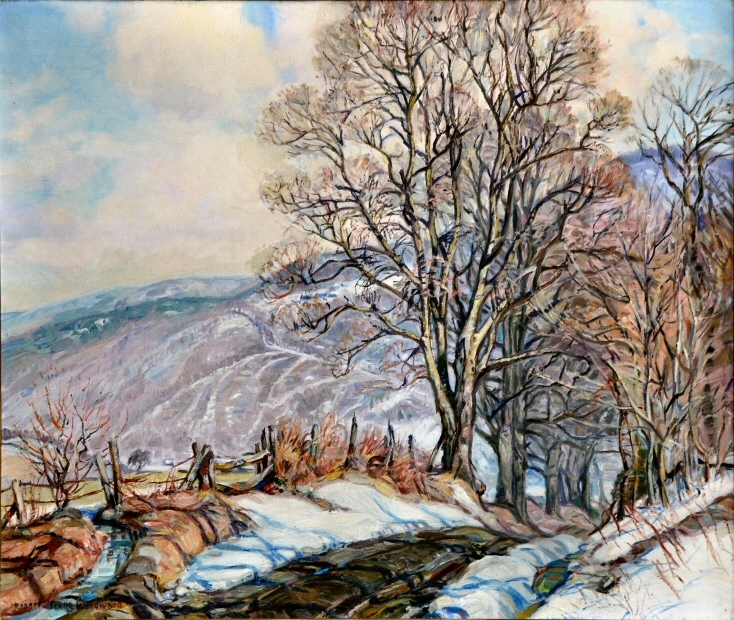 It could be argued that he painted things so intimately and up close, that it could could be Anywhere, U.S.A. Though we have known its location for some time, this is the first time we have an original picture of this painting! 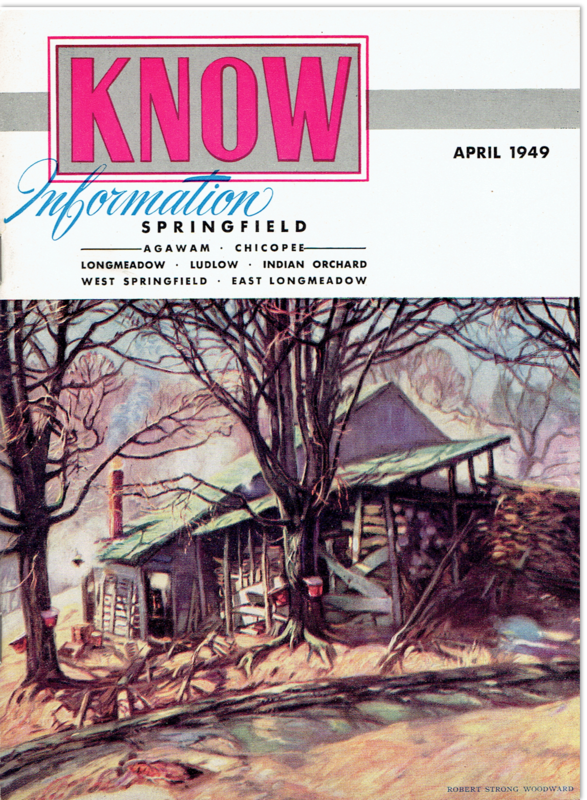 We previously used the nicest image we had which can be seen below on the cover of "Know" magazine. This painting is currently located in Virginia. little town of Buckland, Massachusetts.